Tecnologic UK specialise in bespoke heating elements for a wide range of industrial applications. Many of our clients are in the process control industry, and temperature measurement and regulation is a frequent requirement. Tecnologic provide a full range of process control components to enable heat-related processes, including specialised temperature controllers, from basic thermostats to high accuracy PID controllers, and more general purpose PLCs with temperature inputs. To build a complete control system, however, manufacturers also require industrial quality heating elements which are accurate and reliable, in order to provide their clients with a complete solution. 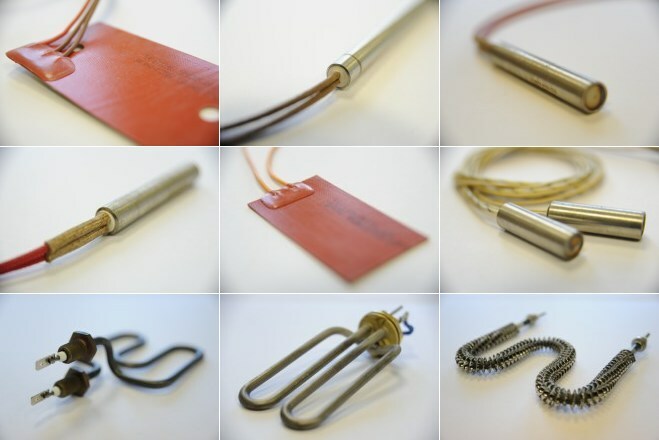 So we also supply a comprehensive range of custom heater elements to meet the specific needs of our clients including tubular heating elements, cartridge heater elements, flexible elements, ceramic heating elements, Mica strip and band elements. Heating elements often need to fit into a space of very specific shape and size as part of the overall product design. Flexible and tubular heating elements in particular both offer the ability to achieve a high degree of control over form factor, with an almost infinite range of shapes that can be achieved. It’s usually desirable to specify a maximum wattage for a heating element, for two reasons. The first is safety – to minimise the possibility of a heater overheating to levels which could present a risk to the surrounding equipment. But it’s also important from an economic point of view, to prevent unnecessary energy use. We can design elements to operate within highly specific parameters. Different types of element have different characteristics in terms of speed of heating up and cooling down, depending on the materials and overall design used. We can take into account these preferred characteristics and design custom heating elements to deliver the desired response. As well as its heating characteristics, it is also important how an element interfaces with its electrical supply and how it is fitted into the surrounding device. We can provide complete control over all aspects of termination. These include issues such as the angle at which the join occurs, length of cables, flexibility of cables, type of join and cable material (e.g. silicon, fibreglass, Teflon, Duraflex). For instance, depending on the surrounding environment, joins and cables may need to be waterproof, chemical resistant, heat resistant and so on. In addition, the design can include mounting holes or other features required for fitting. We can also factor in how long a heating element needs to last, either in elapsed time or in terms of the number of heating cycles, bearing in mind the costs associated with replacement. For instance, some types of equipment are used occasionally and can be easily accessed – so the cost of carrying out a heating element replacement is relatively low in terms of downtime and servicing costs. But equipment which is used continually, or where access is difficult (e.g. submerged in liquid) needs to aim for as few replacements as possible. We can also factor in protection from vibration, knocks and so on, as necessary, to reflect the environment in which the equipment will be used. Bespoke Heating Elements – View our full range of elements or talk to our team of experts today.